2018 was a year for the ages. We had a fire in June but we fully recovered. We hired Will Percival, the Mike and Ophelia Lazaridis Distinguished Chair in Astrophysics, to direct the new Waterloo Centre for Astrophysics. Five of our graduate students received Vanier awards, and undergraduate Emily Pass won the triple crown in Co-Op undergraduate astrophysics. I had the pleasure of attending the Nobel Prize ceremony in Stockholm to share the joy of Donna Strickland’s Physics prize. 2018 will be hard to beat, but 2019 holds great promise as the concepts for our new Physics research wing and the Science Centre for Innovation are moving to completion. Last month I had the pleasure to present Faculty of Science Distinguished Alumni Awards to Dr. Rob Myers of Perimeter Institute and Dr. George Pinho of Christie Digital. 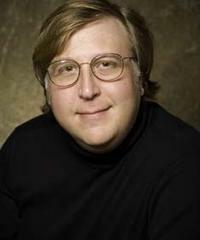 Two weeks later, Rob was appointed Director of Perimeter Institute. This is an exciting time to be a part of Waterloo Physics. For those of you considering physics as a way of life, please take a close look at our programs. Rob and George represent the level of achievement you can expect of yourself with a Waterloo physics degree. Come and share in the excitement of doing physics at Waterloo: a great department at a great university, located in a great community that lives and breathes physics. 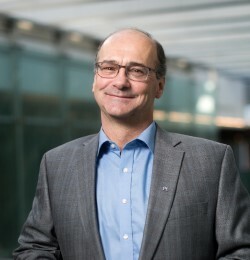 Last week, the Perimeter Institute for Theoretical Physics named Waterloo Science alumnus Robert Myers (BSc Physics - Co-op ‘82) as their new director. He succeeds the previous director, cosomologist Dr. Neil Turok, who held the position since 2008. Imagine if we could remove pollution from the atmosphere, not worry about the security of our private information, or design drugs targeted for more effective treatment against disease. Poised to revolutionize society, quantum technologies may help us overcome these real-world problems and other research challenges — and PhD candidate Kristine Boone is helping to pave the way. 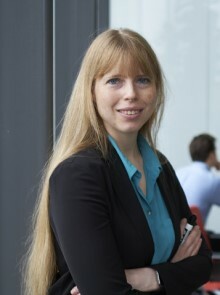 Christine Muschik, assistant professor at the Department of Physics and Astronomy and the Institute for Quantum Computing (IQC) at the University of Waterloo, was selected as a 2019 Alfred P. Sloan Research Fellow in Physics. Dr. Jennewein's main research passion is how to achieve quantum communications and a Quantum Internet on a global scale. In particular he is currently pursuing the use of satellites to accomplish intercontinental distances, and is possible with today’s technology.